Have you ever had one of those does where absolutely nothing inspires you? I'm having one of those days. Nothing sounds interesting to do, nothing sounds good to eat, none of your nail swatches speak to you, and etc. It is Monday, it's just one of those blah days, where you just go through the motions. Despite, my uninterested tone, I do really love this Zoya color. Dannii is a medium purple with pink & silver micro shimmer. 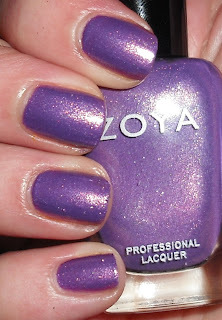 This is another winner from Zoya. I've said this many times, but Zoya wins for me as far as my favorite brand. I love the originality of their colors. Many of their colors have some extra special touch to them that makes them beautifully unique. I looove Danni! Such a pretty shade of purple! I'm having one of those days. Don't know what color-purple, blue, pink, coral; don't know what finish-creme, shimmer, frost, glitter. But it is time for a change! Danii reminds me of ChG Grape Juice. So pretty! I just got into Zoya polishes in the last 6 months or so and I keep buying more because they are fantastic! Thanks for sharing! I agree about Zoya! Whenever I try or see new colors from other brands like OPI and Essie, I can't help but imagine all the dupes out there or that I already have. I feel like Zoya and Butter London both stand out with unique colors. Great color! I've been feeling blaaaah for what seems like ages now. Oh well. This polish looks gorgeous! I really want it. ok this nail polish is sooo me...my name is danielle and i would so wear this. beautiful. I like this one! i love all purples. So pretty!!! I really need to use this polish. I dont think anyone does shimmers like Zoya. I've got Dannii but haven't tried her yet...it looks great on you....I should definitely wear her!